I spent more than a reasonable amount of time researching and experimenting in order to determine the best location for aftermarket outlets. It sounds a little strange I suppose, but any mod that requires drilling or otherwise modifying the FJ’s stock configuration, normally leaves me to pause a bit. For those keeping up with my previous articles, you’ll note that I prefer to keep modifications as close to stock, in appearance, as possible. It’s about blending in and avoiding the “sore thumb” syndrome. 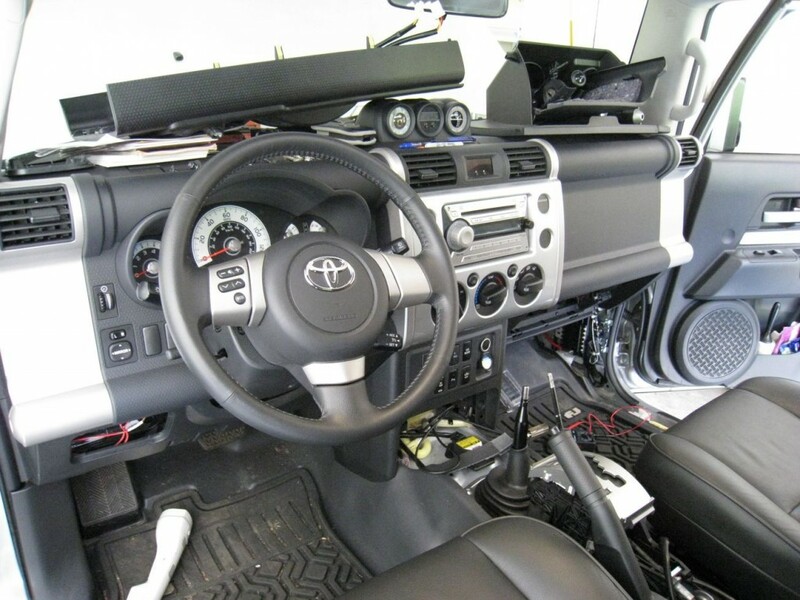 Luckily, there were quite a few folks who paved the road before me, so I was able to view photos of outlets installed in a variety of different locations within the FJ before I began my own 12v installation. 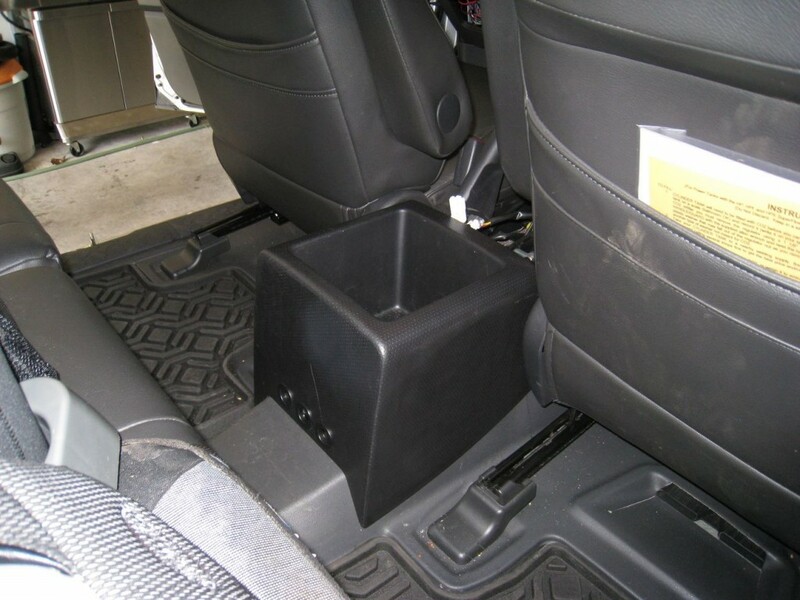 When all was said and done, I came up with a perfect outlet location for my needs – the rear vertical face of the center console. 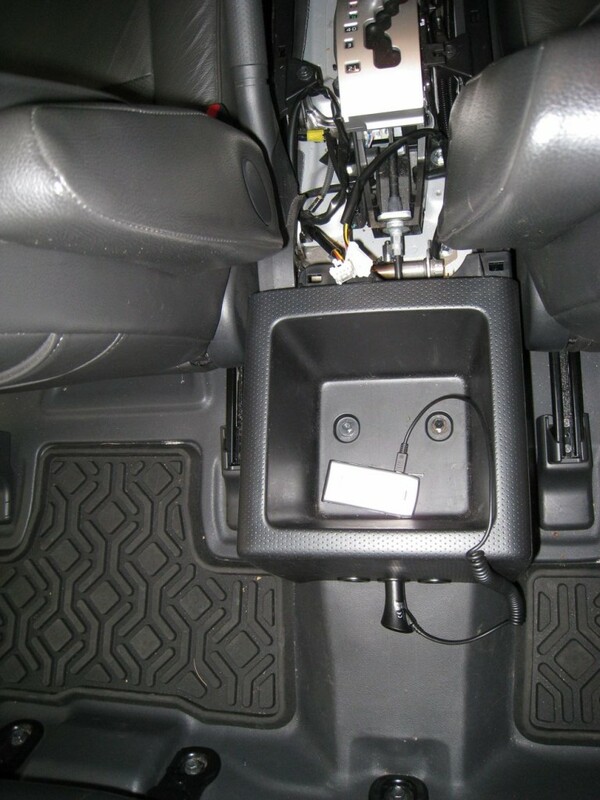 One of my main goals with this installation was to provide 12v access for passengers in the back seat. But I also wanted these outlets to be reachable by the front passengers. With the limited amount of storage space available, I decided to place the outlets on the outer rear face of the center console. 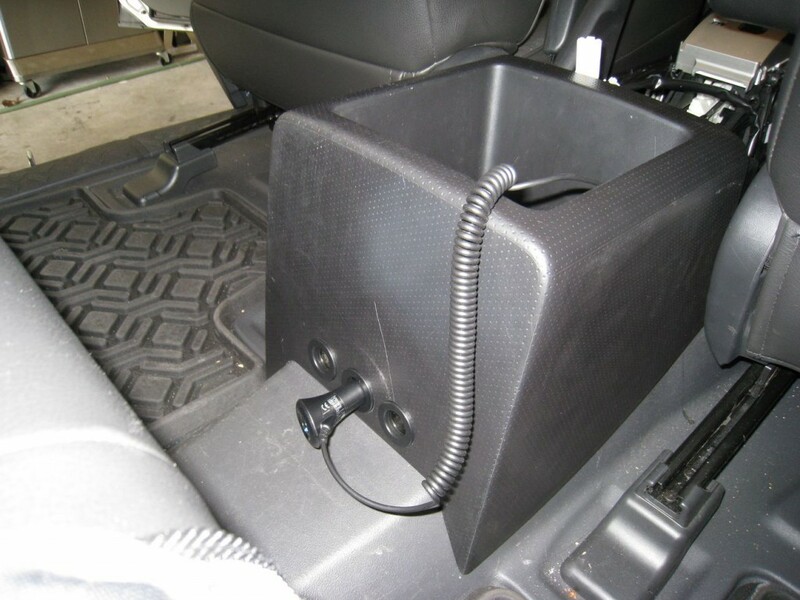 This keeps the plugs from interfering with items stored within the console itself, and for the most part this location seemed like it would work very well for charging cellphones and powering DVD players for the kids in the back. The only drawback I saw with this location was the potential for passengers with longer legs to inadvertently step on a cord or plug and possibly damage the outlets. But since my rear passengers are generally of a smaller denomination (my kids) and they sit on opposite sides of the FJ, I didn’t foresee this as being a big problem. 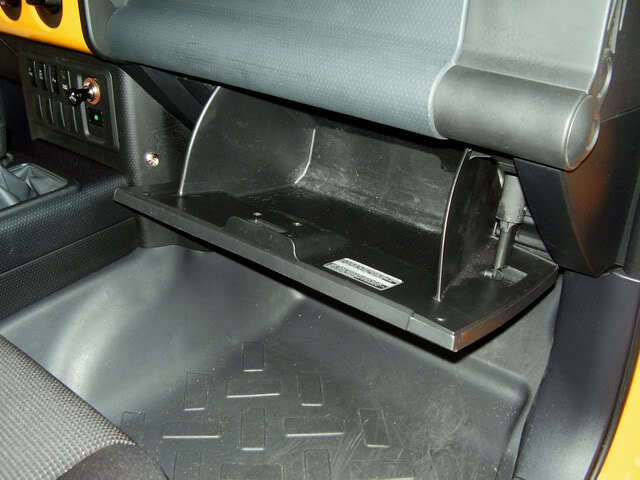 Even though it takes a little more time up front, removing the center console from the FJ will save you a lot of time in the long run. This makes drilling holes for your outlets much easier and allows you to run the wiring more easily as well. 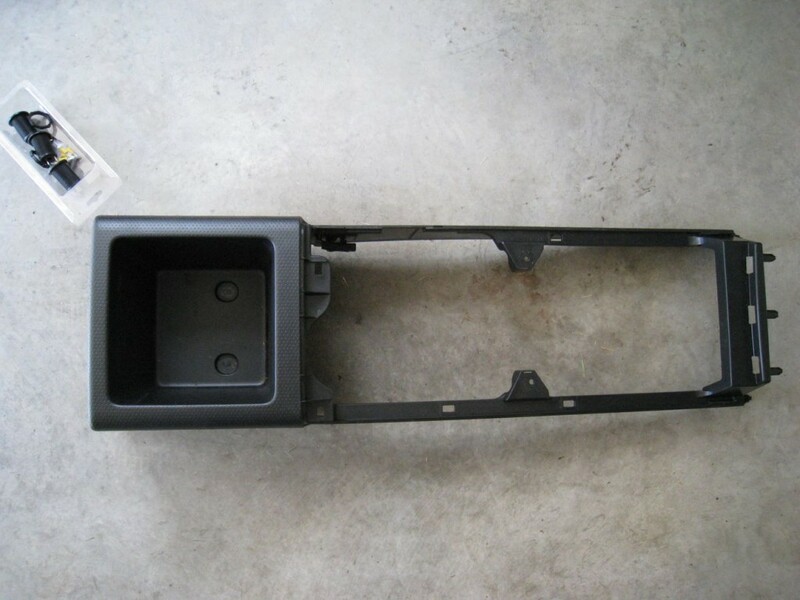 Removing the center console is actually pretty simple. 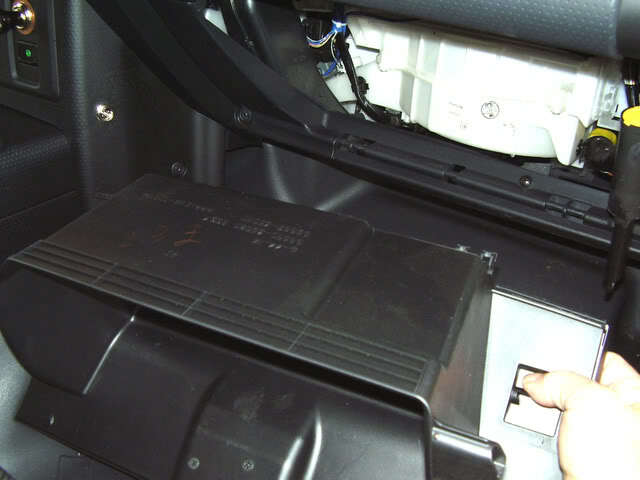 You’ll need a 10mm socket wrench or driver to remove the nuts holding the console in place. 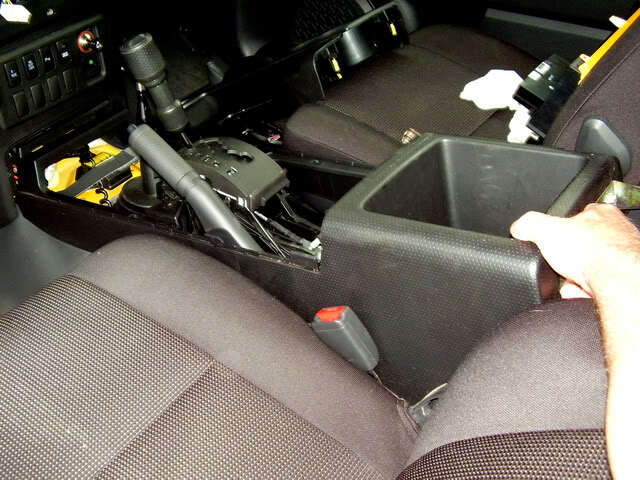 Note: it’s much easier to remove the bottom of the console if the front seats are in the reclining position with the armrests pointed up and out of the way. 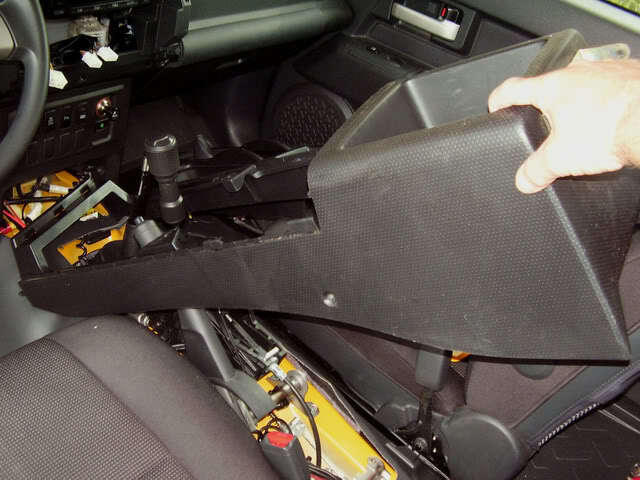 The center console of the FJ is actually two separate pieces so we need to begin by removing the top-most piece. This will give us access to the lower piece and two of the four bolts required for removal. 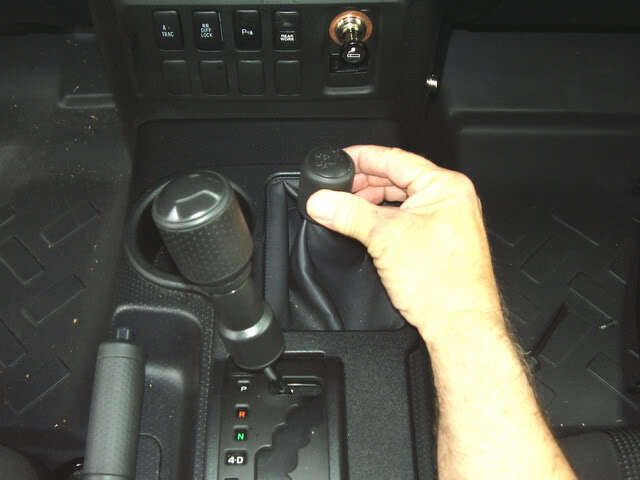 Start by unscrewing the knobs on the transmission and transfer case shift levers. 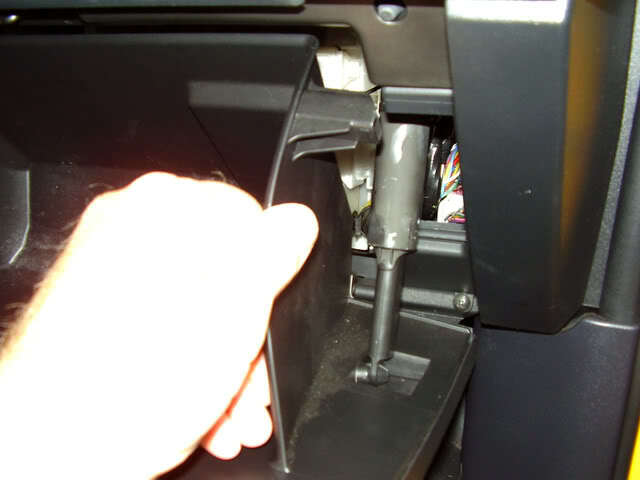 Lift the emergency brake into the engaged position and carefully remove the plastic trim piece directly below the shift lever itself. It just snaps into place but I found that a small flat blade screw driver helps to pop it out. 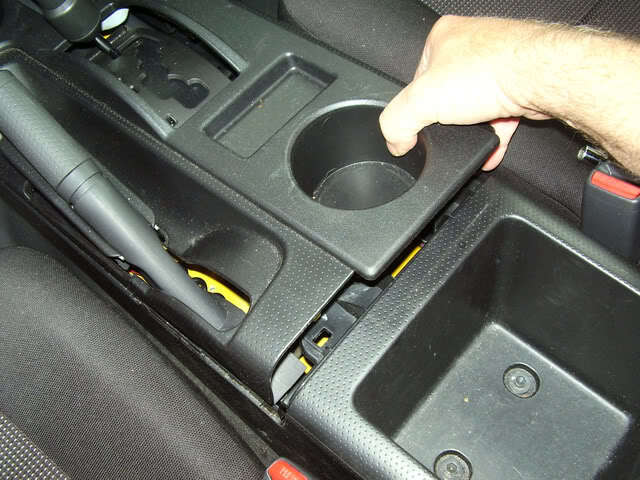 Grip the console just forward of the console’s rear storage compartment (cup holder area works well) and pull upward to remove. Take care when passing this piece over the now-knobless shift levers to avoid scratching the plastic. 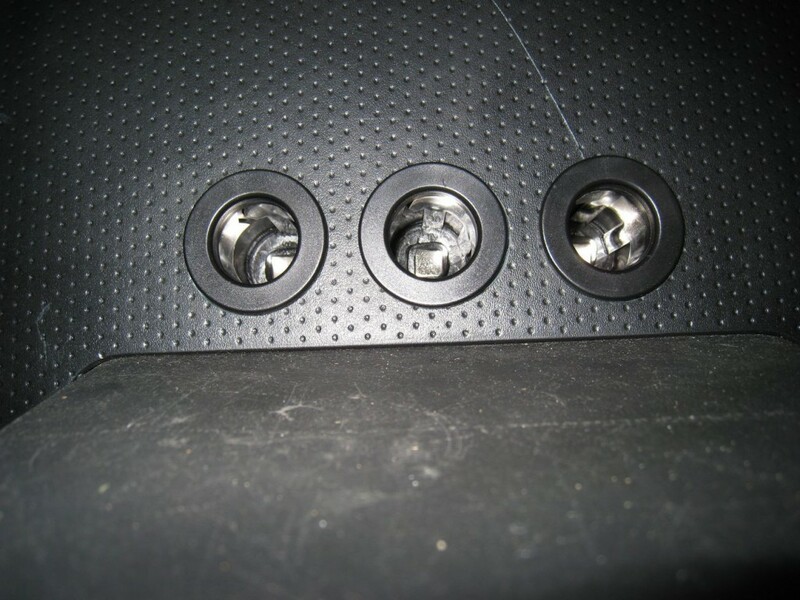 With the top piece of the console out of the way, you now have access to two of the four bolts that hold down the bottom portion. 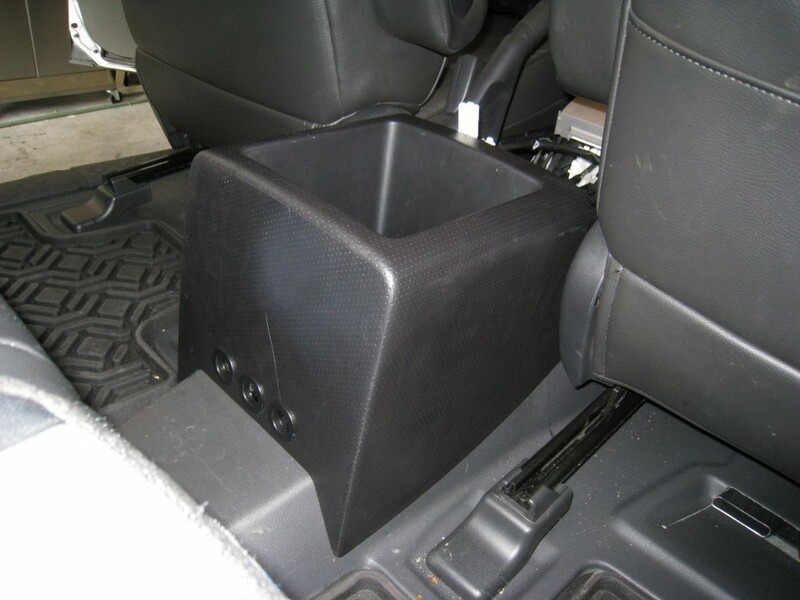 The rear storage compartment of the console is lined with a molded rubber separator. Lift this separator out to reveal two additional 10mm bolts. 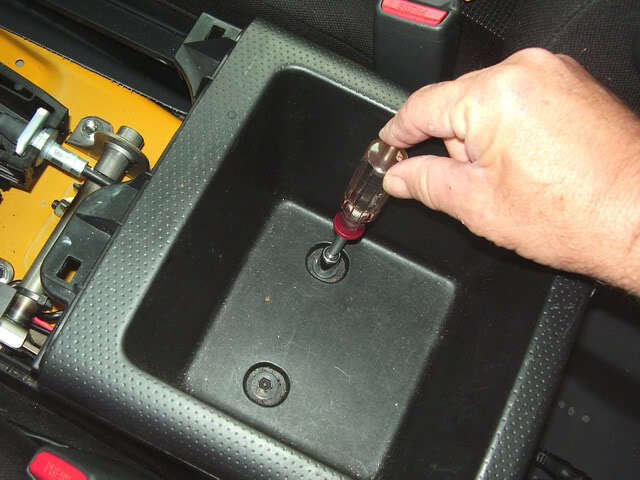 Use your wrench to remove these two bolts, along with two additional bolts further forward, located on each side of the transmission shift lever. 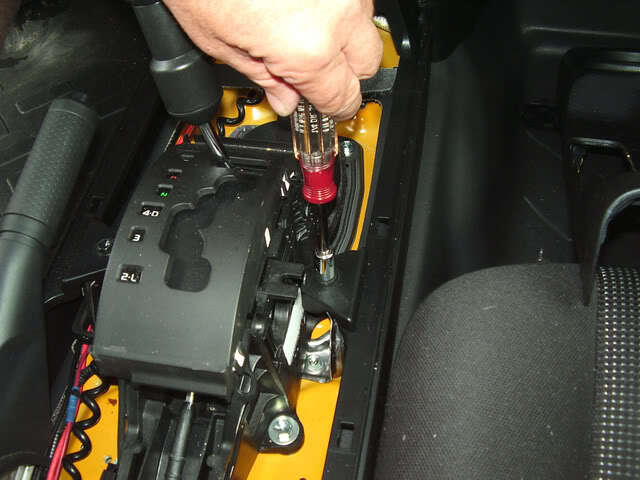 Once these four bolts are out, you can remove the remainder of the console by pulling upwards and backwards. It’s a tight fit so it might require a little twisting. This is the main reason I suggest lowering your front seats all the way back since it makes this process much easier. 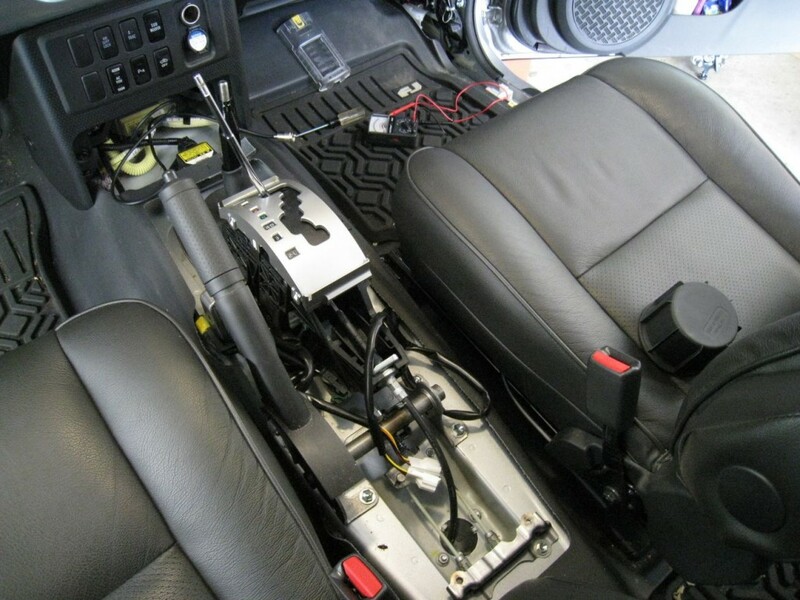 With the center console successfully removed, it’s time to to map out placement for the new 12v outlets. 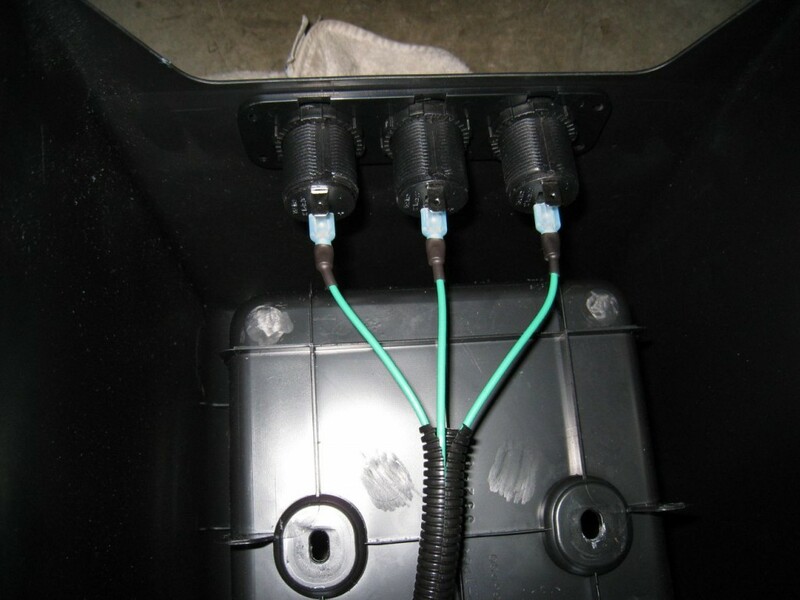 When it came to purchasing the outlets themselves, I ended up ordering a triple receptacle outlet from West Marine. The outer ring provided both a template for drilling and additional structural support when mounting the individual outlets. When it comes to actually making the holes for your receptacles, I suggest using a hole saw that’s just slightly larger than the receptacles themselves. This will ensure a tight fit once the outlets are in place. 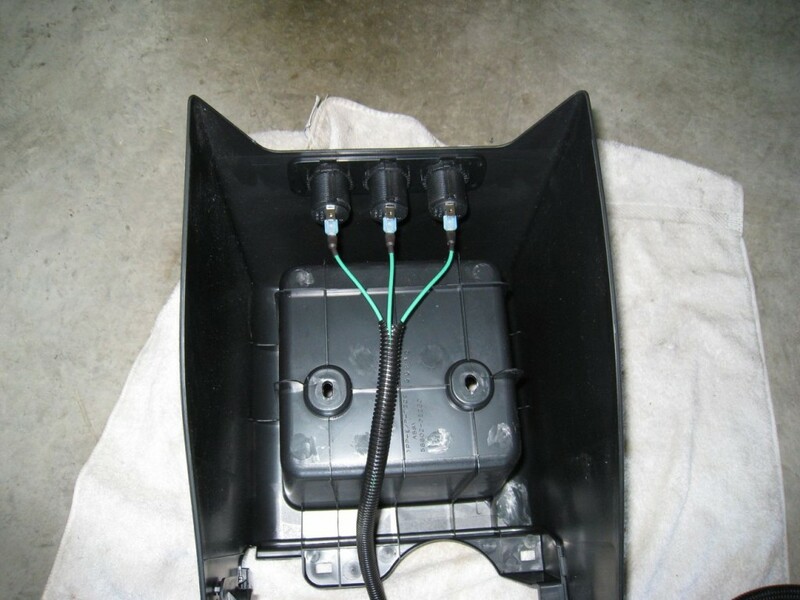 It’s also important to note that measurements should be taken ahead of time to ensure that your mounting location has enough clearance underneath and behind to allow for both receptacles and wiring. 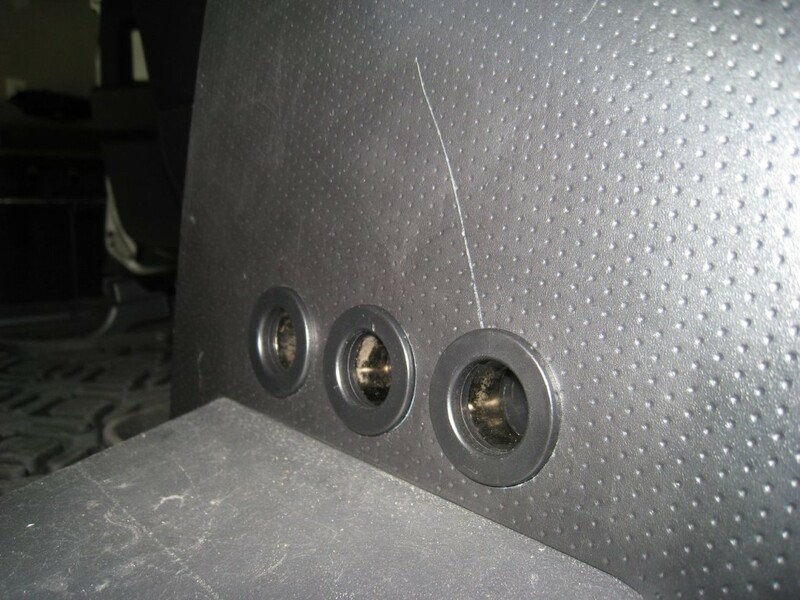 This includes accounting for metal components and other potential obstacles under the console when it’s restored to its original location between the seats. If you don’t already have some lying around the house, pick up a roll of painter’s tape. 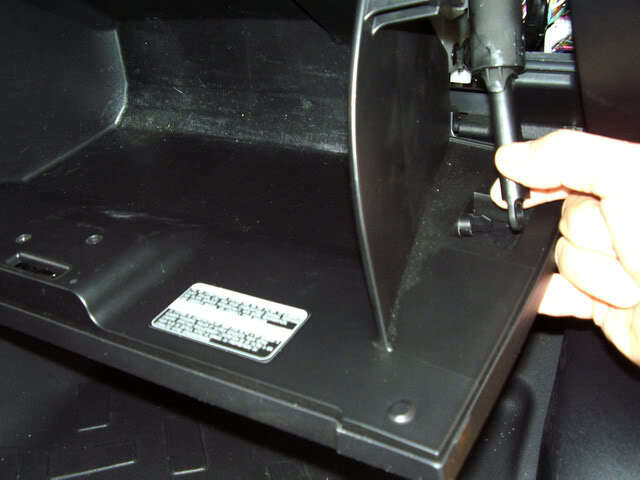 You can use the tape to cover the area of your console where you will be drilling. This will help keep the edges of the hole from becoming ragged when you punch through and helps prevent scratching from the drill in general. Be sure and apply the tape to both sides prior to drilling. Then use the plastic mounting plate that comes with the outlets to trace the hole positions. The holes will generally need to be slightly bigger than the traced lines, but this will allow you to center punch each circle so that the outer diameters are even all the way around. Also, be careful when you start drilling because the plastic surface is somewhat slippery. I managed to make a nice groove in the outer face of the console when the center bit of the hole saw slipped sideways. 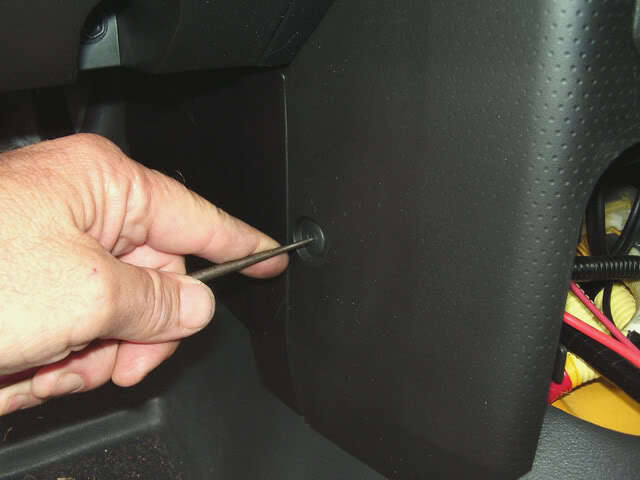 Once the holes are drilled, the outlets themselves are not difficult to install. I ended up placing the triple mounting plate behind the console wall rather than mount it on the outside. I also removed the rubberized caps from the outlets before installation. Both of these changes helped to give the install a cleaner look – closer to stock. Removing the caps does make the outlets slightly more vulnerable to water and debris though so use caution if you follow my lead. With the outlets now in place, it was time to address the wiring situation. In my case, I had already installed an auxiliary fuse panel in the passenger-side kick panel, so that was my ultimate destination. For my wire choice, I opted to use 14AWG to support a larger number of accessories. I already had a spool of 14AWG that I had purchased for previous projects but you can pick up wire like this from almost any hardware store or even order it online. 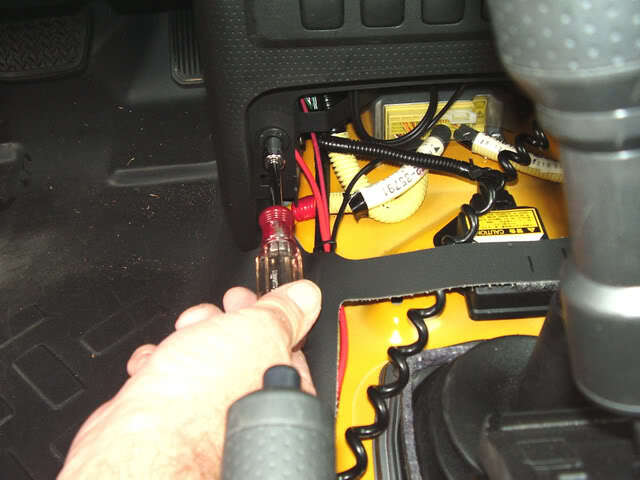 I decided to route my hot leads under the center console towards the vehicle’s dash and then turn right, heading up and over the glove compartment and completed their route at my auxiliary fuse panel. As I recall, the rough measurement for this distance was around 9 feet of wire, but your length may vary depending on where you plan to hook into a 12v power source. 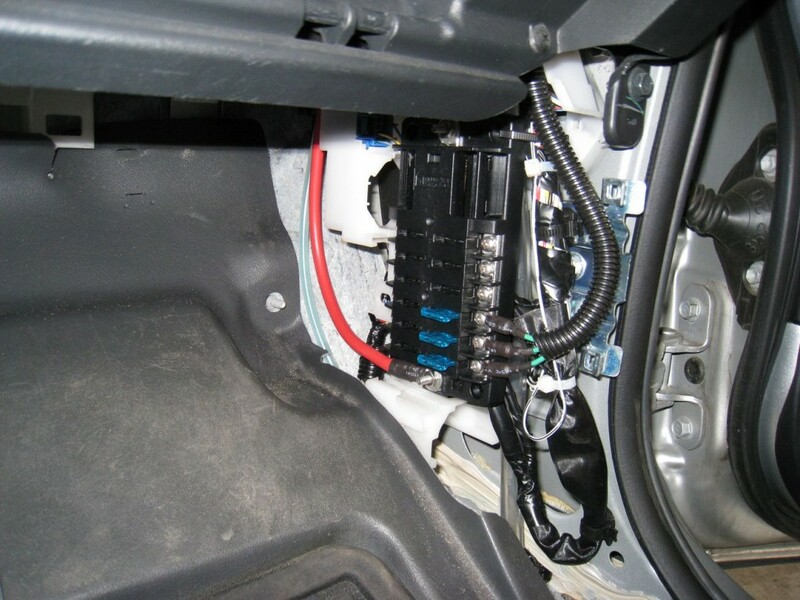 As an aside, if you plan to add multiple 12v outlets or other accessories, I highly recommend adding an auxiliary fuse panel as it will save you a lot of hassle in the long run. 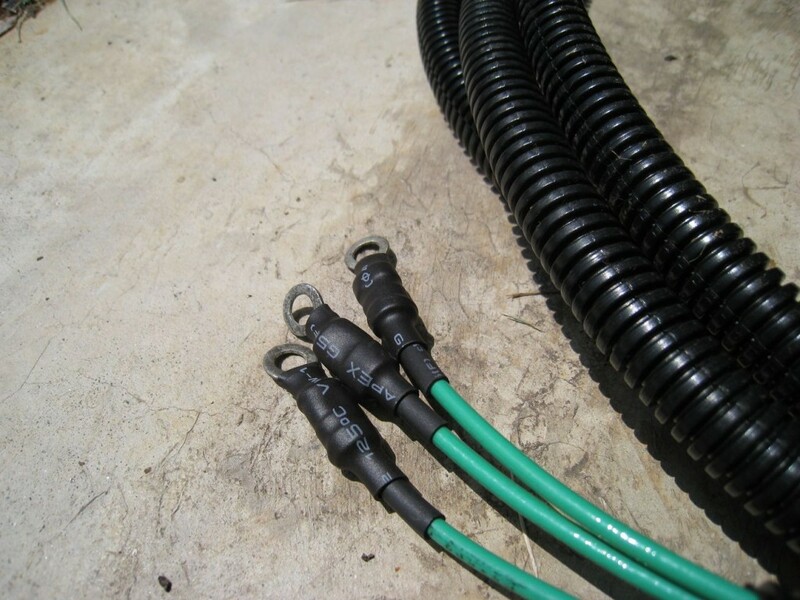 It not only centralizes all of your aftermarket accessory hook-ups, but it eliminates the need to splice into existing (stock) wiring which can lead to a whole host of problems down the road. 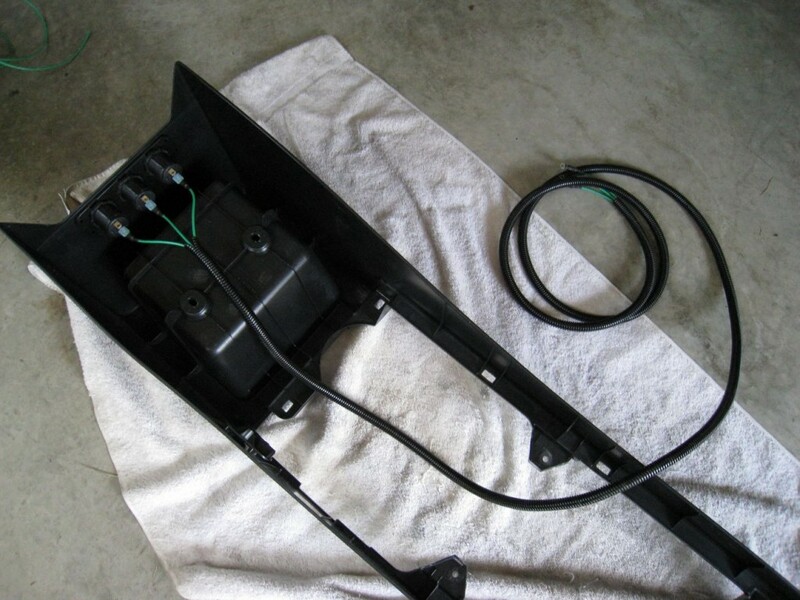 To aid in the wire routing process, I ended up removing the passenger side glove box and the lower passenger kick panel where my fuse panel is mounted. Depending on where you route your wires, you may or may not need to remove the vertical console where all the stock switches are located. I didn’t remove it, but I did loosen it a bit since it made it easier to feed the wire loom and wires through and behind the dash area. 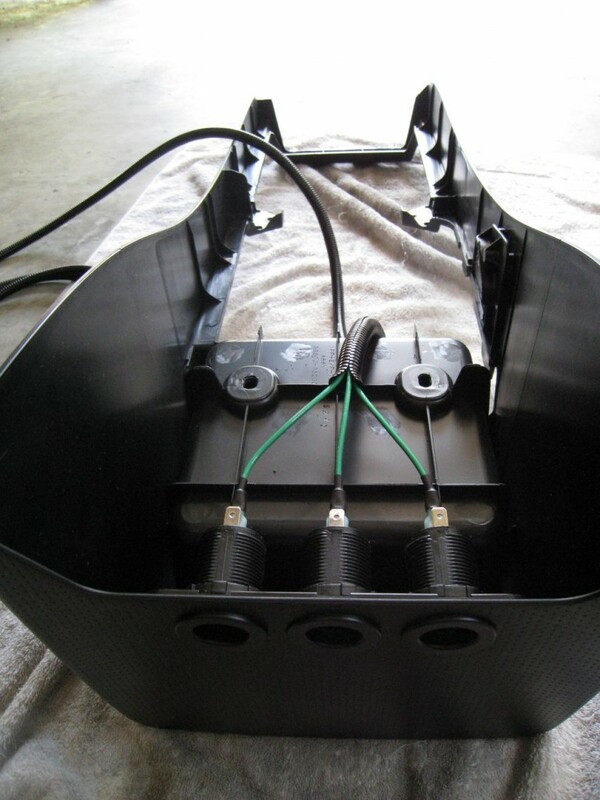 The vertical console is held in place using two 10mm bolts in the front lower section, a single plastic pop pin on each side of the console, and a series of plastic snap-in connectors. 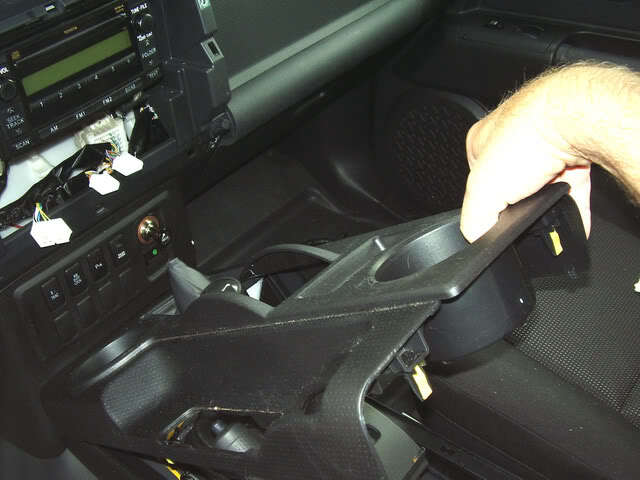 Once the two bolts and two pins are removed, this center console section can be pulled away from the dash area using a rearward motion to dislodge the snap-in connectors. Be careful not to pull too hard because the wiring for all the switches is still attached. You’ll need to disconnect these wires first if you want to remove this piece completely. Since I planned on adding three outlets, I required three separate hot leads. I pre-measured the wire and snipped each one to the proper length. I would also need three separate ground wires. I decided to use one of the forward bolts that holds down the console as my ground since it mounted directly into the sheet metal of the transmission tunnel. I measured the distance for these wires as well, and cut three of them to the necessary length. 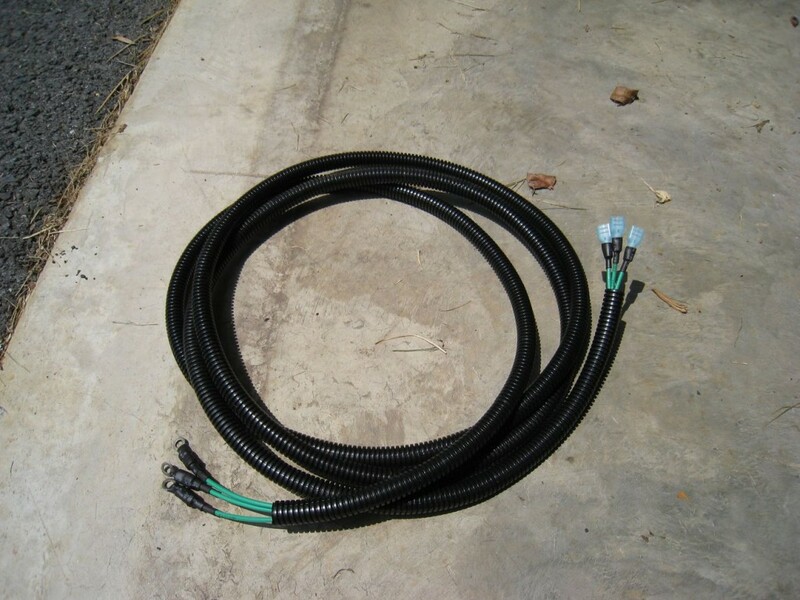 I then bundled the three hot leads together using 3/8″ wire loom cut to the same length (minus a small portion at each end to allow the wires to separate for hook up). I did the same procedure for the grounding wires. The wire loom not only helps to keep the wires together, it also helps prevent unwanted abrasion due to vibrations around metal parts. Although it’s not always the case, I try to make a habit of soldering and heat shrinking any connectors on the ends of my wires. 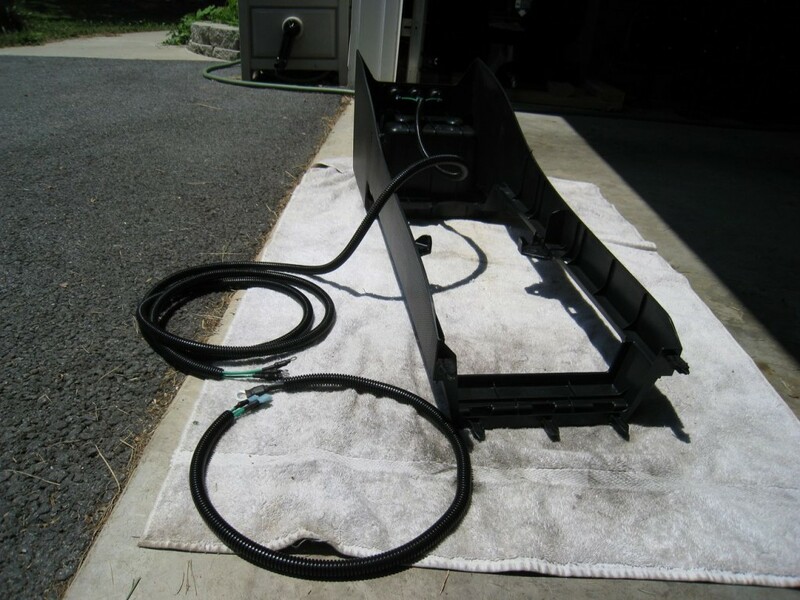 This helps prevent unwanted grounding, loose connections, and just looks better from a cosmetic standpoint. 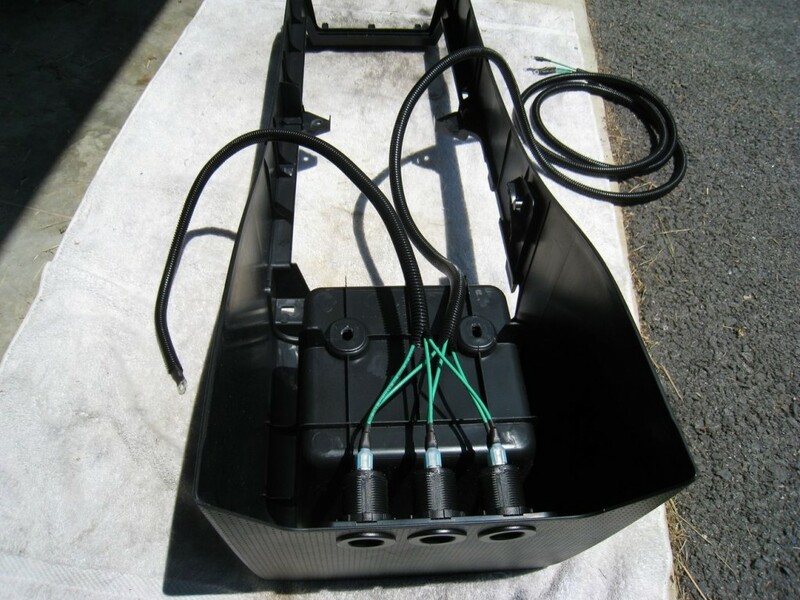 I used female spade connectors for the ends of the wire that mount to the back of the 12v outlets, and ring connectors for the end that hooks to the fuse panel. With the console flipped upside down, I attached the two bundles of wires (hot and ground) to their respective tabs. 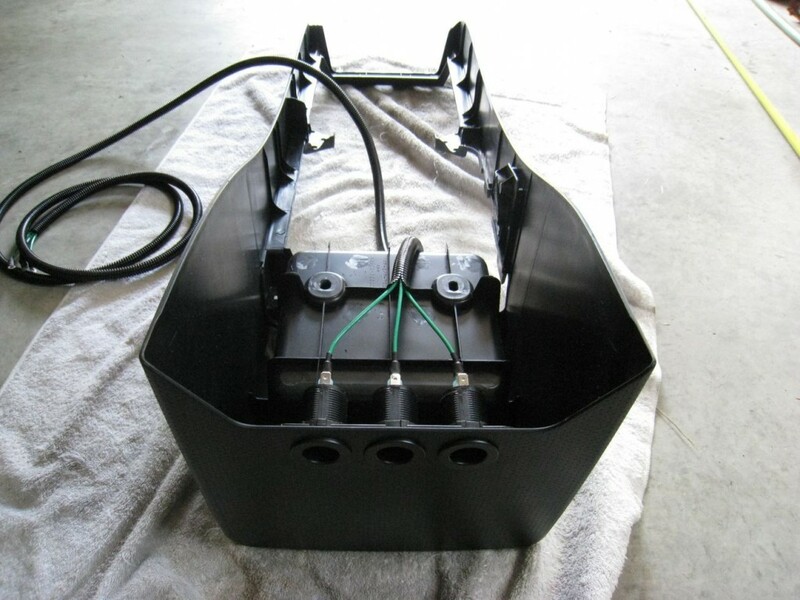 The spade connectors make for a tight fit but the snugness helps prevent the wires from coming loose on their own once the console is restored to its former home. I then loosely routed the two bundles of wires to the other end of the console and carried the entire assembly back to the FJ for a test fit. Because the grounding wires were all going to the same bolt I decided to combine all three wires at the end and used a larger ring connector to accommodate the 10mm bolt. I ended up having to bend the ring connector slightly to allow the plastic tab of the console to sit properly once the ground wires were in place. 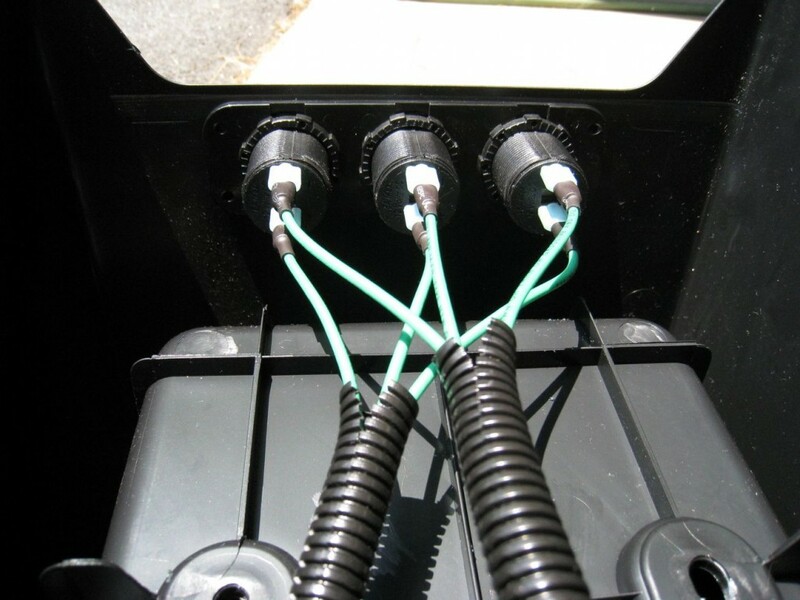 While restoring the center console I took measures to ensure that all wires were routed around any locations or objects that could result in pinching. Once the hot leads reached their destination, hooking them up to the fuse panel was a quick and painless process. The 14AWG wire I used is rated for up to 17 amps so I utilized a 15 amp fuse in the panel. Most hand held accessories run between 1.5 and 5 amps so you can probably use a smaller fuse if you prefer. Just remember to keep your wire gauge and fuses in sync to avoid catastrophic meltdowns. 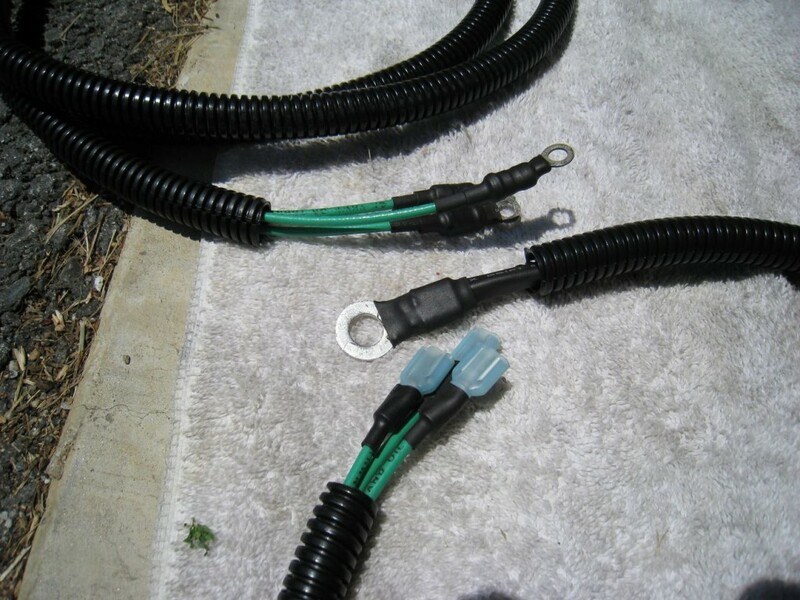 If you’ve read through my auxiliary fuse panel installation article, you’ll note that half of my connections are always hot and the other half are switched. In this case, I attached the 12v outlets to the switched side of the panel to avoid draining my battery when the key is turned off. So other than restoring the various panels and pieces to their original location, that’s pretty much it for the install. There’s not really that much to it once you’ve installed an auxiliary fuse panel. For me, the most difficult part of the entire installation was choosing a location for mounting the outlets. As you can see, having an auxiliary fuse panel in place makes little additions like this a relatively quick and easy process. I now have a total of four 12v keyed outlets in the FJ that are all easily accessible. 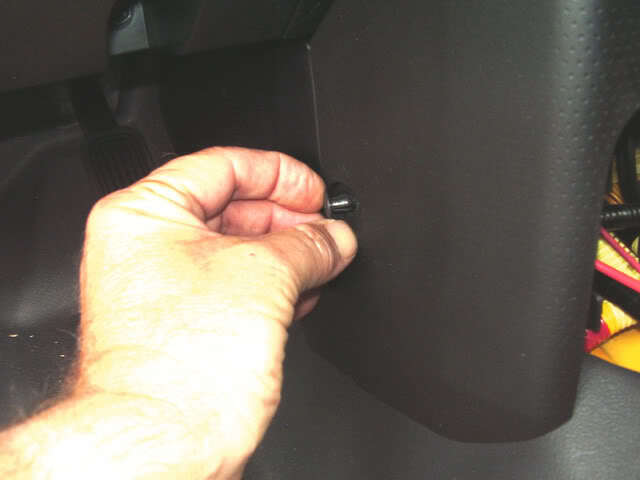 This allows the kids to watch their movies without having to disconnect some other accessory and the rearward location of the plugs eliminates the potential tangled mess of cords that occurs when plugs are mounted in the front of the console or other areas in the dash. In the future I hope to add several more outlets in the rear cargo area. This will make it even easier to plug in accessories while camping or traveling in the outdoors. Overall, since performing this installation back in July of 2009, I’ve been very happy with the result. As I stated above, multiple outlets means no more swapping accessories when one item runs out of charge. My chosen location for the outlets has proven very effective for all passengers to access and I’ve had no problems with anyone stepping on or otherwise damaging the connectors. So I’m quite pleased with the outcome. 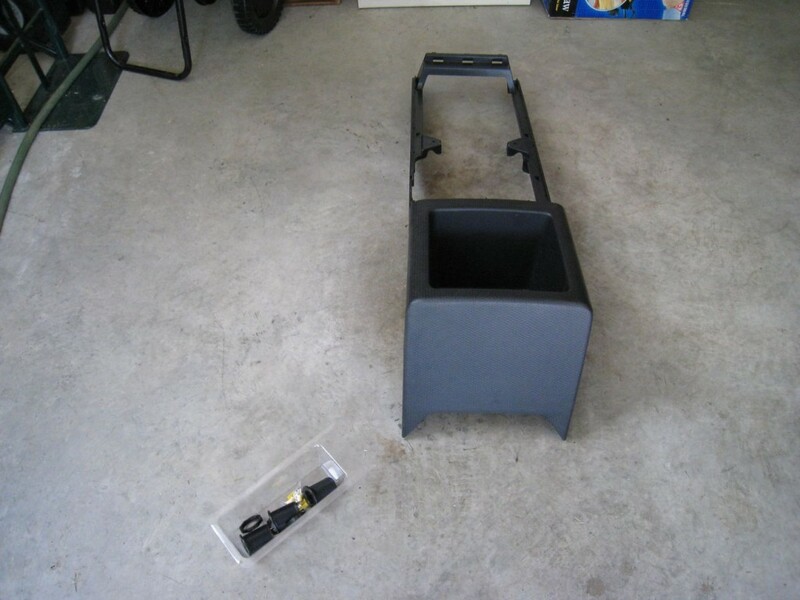 As far as lessons learned… as nice as the West Marine receptacles are, their inner structure appears to be designed rather loosely. They’re good quality outlets but depending on the style of 12v accessory plug, the plug itself might not fit as tight as you might like. I’ve run into problems in the past were a plug is inserted, but it manages to wiggle its way backwards far enough that it loses the connection. So if I had to do this again, I’d try and find a receptacle that fits tighter around the plugs. The only other lesson I learned was to make sure your drill is secure before drilling your holes. As you can see from the pics above, I left a nice little scratch above the first hole because the drill kicked to the side when I started drilling. In the end, the back of the center console worked perfectly for my needs. But there are literally dozens of other locations for adding outlets. I suggest poking around the FJ Cruiser forums if you’re looking for other ideas. 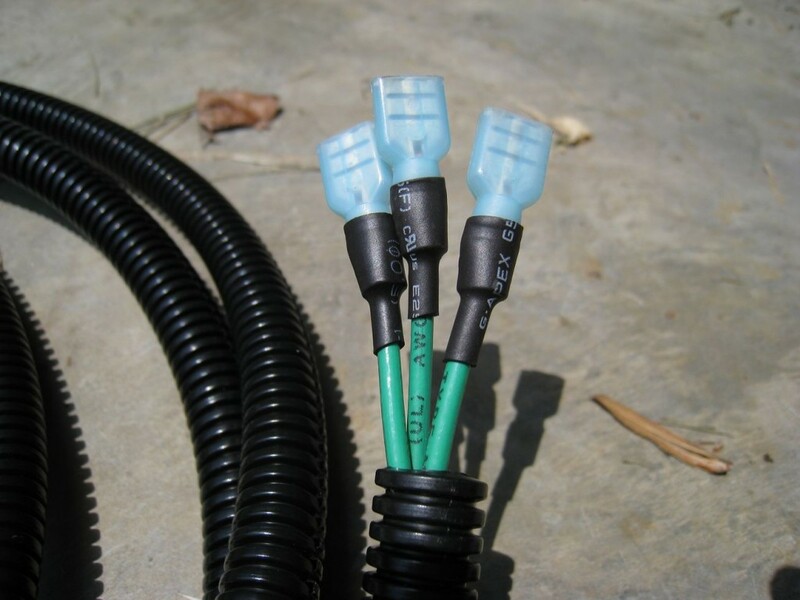 There are quite a few 12v installation posts to browse through to get an idea of what might work best for your particular needs. 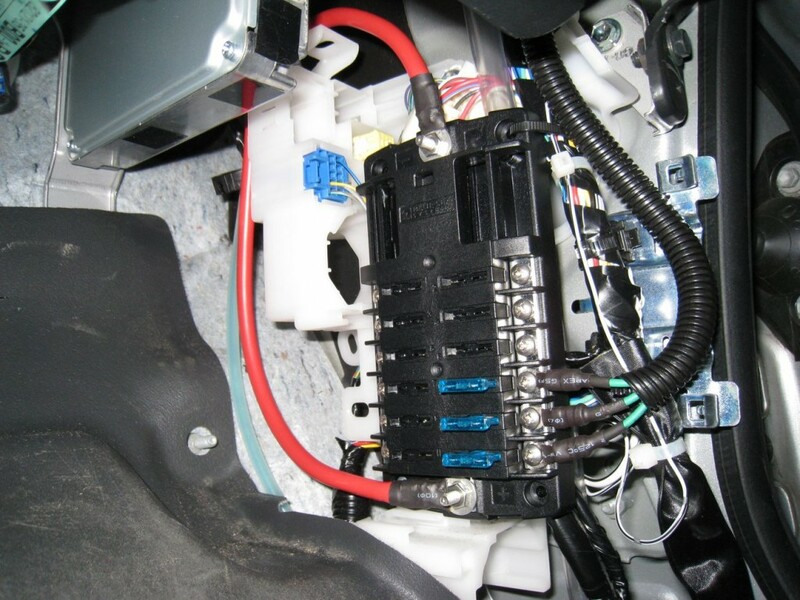 Just remember to keep it separate from the stock electrical system whenever possible. 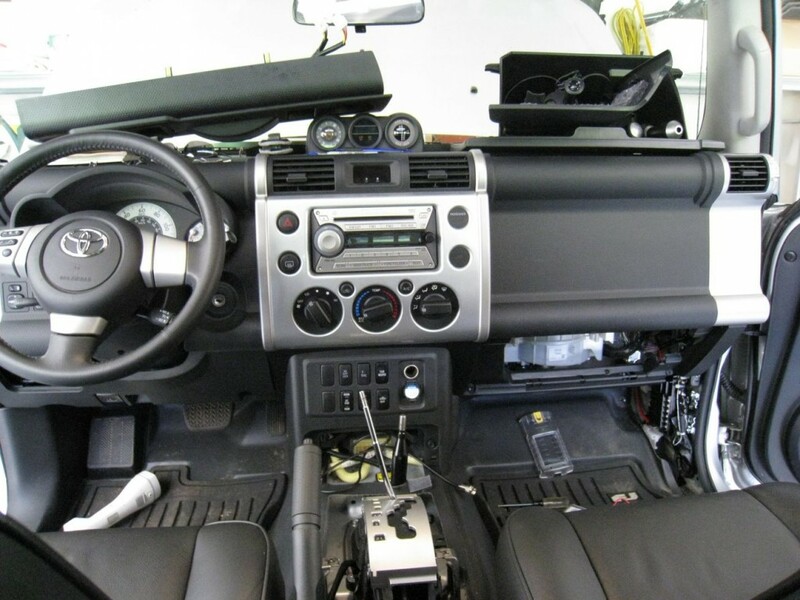 As you can tell from above, this install isn’t terribly complicated, but if you’re not comfortable with this type of modification, I always recommend taking your vehicle to a professional installation shop. 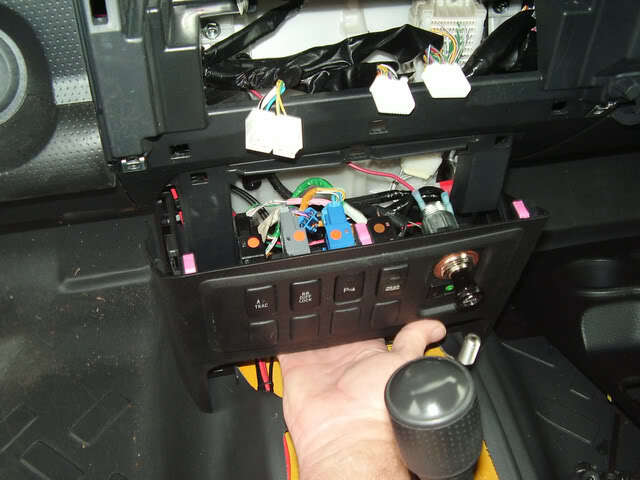 I’d like to thank Landcruiser Steve in the FJ forums for the detailed console removal pictures. Lastly, don’t forget to check out some of the related articles below and if you have any questions about this install or other articles on this site, please feel free to post up a comment.